Salesforce has introduced a new framework in its Platform with the aim of accelerating any company’s ability to deploy personalised customer experiences. The Salesforce Lightning Bolt framework helps companies jumpstart the creation of a new community, next-generation portal or customer-facing website with tight integration with Salesforce CRM faster and at lower cost. Last year, Salesforce introduced Lightning Templates for Community Cloud, enabling companies to quickly create customised communities for their customers, partners and employees. With the new Lightning Bolt framework, Salesforce is taking the template concept to the next level. Now, any Salesforce developer, Salesforce consultant or partner in the Salesforce ecosystem can build industry-specific Salesforce Bolt solutions, such as e-commerce, partner relationship management and patient care portals. Salesforce Bolt solutions should bring something new to the table because they contain industry best practices, Lightning Components, business logic and are all integrated with Salesforce CRM, helping companies to deploy next-gen customer experiences faster than ever. Ten Salesforce partners, including Accenture, Cognizant and Deloitte, have already built Salesforce Bolt solutions for industry-specific communities and portals, such as for B2B e-commerce for manufacturing, PRM for high tech and franchise management for retail. 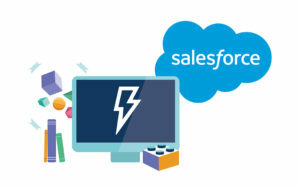 A new Lightning Bolt category on the AppExchange will allow thousands of partners in the Salesforce ecosystem to develop, market and sell Salesforce Bolt solutions. Insurance companies can now supercharge agent and advisor productivity and deepen channel engagement by equipping agents with new self-service capabilities, data-rich dashboard features like Agent360 and sales productivity tools in a modern, easy-to-use, and mobile-friendly portal. Retail in the Age of the Customer demands that store associates be digitally connected and dynamically engaged more than ever before. The Store Operations platform provides associates at all levels and roles the one place to go for current information about their customers, store, department, merchandise, promotions, inventory, and operational details in a mobile first solution. Retailers can now collaborate better with their stores, getting real-time information about consumers, improving worker engagement and accelerating the feedback process necessary to scale their business. Sales reps, service employees and customers in the field that are leveraging CloudCraze’s native commerce application can now rapidly configure and deploy multiple purchasing scenarios that provide all users a streamlined customer experience, such as ordering spare parts or collaborating on a complex set of services in just a few clicks on their mobile devices. Borrowers now have a dramatically shortened loan application process with Cognizant’s reinvented borrowers’ experience that allows them to apply for a loan on their mobile device. This community also accelerates the back-office collaboration between bank and non-bank parties involved in the transaction. Manufacturing companies can now enable sales and service efficiency and effectiveness including CPQ, field workforce management, customer and partner communities and analytics with Deloitte’s FastLean for Manufacturing that supports digital transformation based on best practice marketing, sales, service and field service capabilities. Patients of healthcare facilities can now connect through a community platform that empowers them to seek support from, and offer support to, those who have gone through similar experiences while gaining access to educational resources, group collaboration, local support group events, and tools to document their journey. Retailers can now connect with customers, partners, and employees at scale with a rules-based chatbot, creating a more personalized and efficient experience. Clinical organizations, whether hospitals, practices, clinics or specialty services like MYnd Analytics, are now able to offer their patients real-time scheduling, so patients can easily get in to see their doctor when they need to. Retail store managers and associates are able to quickly access customer information, preferences and purchase history from all channels that the brand and customers interact through. This community will help retailers provide a seamless customer experience both online and in-store. Store employees, field leadership and headquarters personnel can now work together more efficiently and effectively with capabilities such as communications management, task management, holds and recalls, space and fixture management, “Leader on Duty” performance, petty cash management, real estate operations and expense reporting. Technology companies are now able to connect and engage with their partners in a whole new way. With this community, channel managers and partners can engage more effectively and in real-time with deal room collaboration, personalised dashboards that surface actionable insights, streamlined on-boarding, and deal registration—all from a single consolidated solution. If you need help staffing your Salesforce Lightning Bolt project, or you need certified Salesforce Consultants for any other project, contact K2 now.